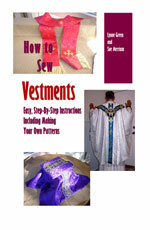 I recently sent for your pattern for the deacon's stole. (I was asked to do this and I haven't made one before.) I am a fairly experienced seamstress, but I am confused with the directions. Surely, there is something that I am missing in my ignorance. Are stole A and stole B two different stoles? I understand the slant seam at the waist to avoid having the seams all bunched up in one place, but I do not, then, see how the shoulder seams connect to arrive at the sort of Gothic arch shape when the entire stole is laid out flat. What am I missing here? Perhaps, I should just pick one up at church and copy it. I thought this would be less bother. Thank you for your help. The two pieces, A and B, are the two pieces of the same stole. Piece B hangs down the back, and Piece A goes in the front from the shoulder across to the waist. We have two pieces, because they face different directions. They need to be connected at the top seam and then lined. I hope this helps. But you're right; it would help to look at a deacon's stole from your church.